Over the years, I had studied numerous topics, ranging from architecture to foreign policy. Although I majored in International Affairs, I minored in Business Administration because I had an interest in both government and private business. Recently, I have been somewhat bored with the political headlines, and so I have decided to take a break from political analysis and commentary to review something else that is of great interest to me - video games. This holiday season, in video games, the big thing seems to be motion capture technology. Microsoft had released their much anticipated Kinect peripheral (formely known by its code name Project Natal) and Sony released their PlayStation Move - both designed to compete with seventh generation gaming console heavyweight, the Nintendo Wii. To combat these new motion "competitors," Nintendo released the Wii MotionPlus almost a full year before Sony or Microsoft. Despite positive reviews for both the Kinect and Move, I highly doubt these add-ons will usurp the Wii from being the leader of the pack and I base this opinion on a couple common sense reasons. The Microsoft Kinect costs $149.99 in addition to the cost of an X-Box 360 - an entry level variation of the X-Box 360 costs $199.00, but you can purchase bundles for as low as $299.00, assuming that you don't already own a system. The PlayStation Move involves the purchse of the PlayStation Eye camera for $39.99 and the PlayStation Move controller (which looks like a Wii Remote with a light bulb at the end) for $49.99, bringing the total cost to around $100, although Sony also offers Move bundles for around $400. 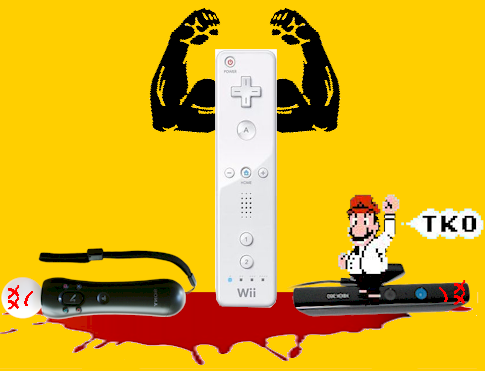 The Wii, with MotionPlus technology, runs around $200, although it is possible to find deals bringing the total cost of the system (with two games) to around $150 - I purchased my Wii for $149.99 new and it came with one remote, one Nunchuk controller, and two video games. So far, the Wii wins on price, being almost half the cost of what you need to compete, and was a major reason why I purchased the system. The other reason why I purchased the Wii was for popular exclusive titles, such as any Mario game. While this may seem like a petty deciding factor as to which may end up being the superior game system, it is, in my opinion, a factor. This is another category in which the Wii has its competitors beat - while the Wii only requires its tiny system and skinny sensor bar to take up space on your entertainment set, the Kinect and Move require much more space. The X-Box 360 and PlayStation 3 are roughly three times the size of the Wii, and if you own more then one system, you are going to have to maneuver the peripherals whenever you want to play (for some this may be an issue). I like the compact design of the Wii, and while I own an X-Box 360, I have no plans on purchasing the Kinect - clutter does play an very minor role in my decision making process. This is a big reason why I believe the Wii will continue to dominate. 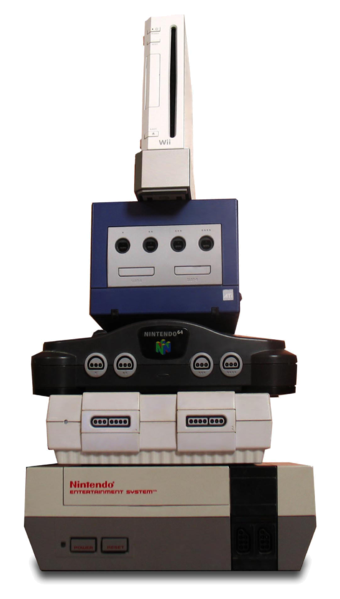 While Sony and Microsoft focused on graphics, Nintendo took a different approach to video games, which seems to be one of the lessons learned from their less-than-stellar system, the Gamecube, and that lesson appears to be playability. Nintendo focused less on graphics and more on playability and entertainment value. This gives the Wii a competitve advantage - why would a PlayStation 3 owner purchase an X-Box 360, when both offer almost identical specifications? This is one of the reasons why I purchased a Wii. I could have spent the same amount of money purchasing a Kinect, but what would I have gotten for my money? Nintendo already had four years of programming on Sony and Microsoft, and hundreds of titles proven to be successes, so why would I want to put down my money on an unproven add-on? This also leads me to another point - experience. The Nintendo designed the Wii to be a motion-supported video game system while the X-Box 360 and PlayStation 3 are both traditional gaming systems. While they may have an advantage over the Wii in the graphics department, they still need to prove playability - so far, the Kinect has been criticized for having a more dificult learning curve then the Move or Wii. The four year head start the Wii has on its competitors not only plays an important role in playability, but also marketability. When plans for the Wii were first released, I was extremely skeptical - I praised the original thinking but feared the system could be a dog like the VirtualBoy of gaming-past. Since its release, and subsequent praise, my fears revolving around the Wii had quickly faded and I counted down the time until I too would be a proud Wii owner. My other video game system purchases had been quite different - after the N64, I had awaited the next generation of video game systems and awaited the proposed release for the next Perfect Dark video game. I was originally going to buy a Gamecube, but when Perfect Dark was not going to be released on that system, I looked at my other choices - the giant X-Box system or the PlayStation 2. I evenutally gone with the latter because of the release of Grand Theft Auto III and the fact that the system was backwards compatable, meaning I would be purchasing a system with an already massive videogame library (a reason why I also purchased my Atari 7800). Fast forward several years, and now it was time to make another system purchase. I was originally leaning towards the PlayStation 3, again because of the backwards compatability, but instead opted for the X-Box 360 when Sony eliminated their PS2 compatability in their slimmed down version. I also bought the X-Box because a friend was upgrading to a newer version of the X-Box 360, which leads me to another negative aspect of both the PlayStation 3 and the X-Box 360 - their constant upgrades. Every few months, it seems that Sony and Microsoft have the newest must-have version of their console that everyone needs to own, and it seems that it is this soap-opera marketing that seems to drive their sales. Nintendo, on the other hand, has been out for nearly the same amount of time, and have focused less time on marketing their system and more time promoting their proven playability - when was the last time you saw a Sony advertisement displaying how much fun the PlayStation 3 was? While Sony had been experimenting with video technology since 2001 (remember their EyeToy release from 2003), Nintendo already had a commercial motion-supported system four years ahead of their competition. Microsoft had already indicated that they plan to have their system last until 2015, with their Kinect released halfway during its lifespan, meaining there are only five years left to enjoy this product - it is only safe to assume Sony has the same time line for their system. While they are going to be forced to support this new peripheral in addition to their original hardware, Nintendo is already looking to the next generation of gaming systems, possibly moving to 3D, or even better motion-capture gaming, and considering they are already years ahead of their competition, it isn't had to believe Nintendo will fall so easily. Basically, Nintendo already has a head start on Microsoft and Sony, but they cannot rely soley on playability to carry them on to through the next generation of gaming consoles - they need to focus on graphics, but they don't need to make that the determining factor - this is why I, as well as so many others, still find so many classic video games on the Atari 2600, ColecoVision, and original NES so enjoyable. I would gladly play N64's Perfect Dark over Microsoft's Halo series anyday - look forward to a Wii Goldeneye 007 versus N64 Goldeneye 007 review soon. Can you guess what my conclusion would be? I don't think I mentioned one of the biggest reasons why I think the Wii will reign supreme - while the Kinect and Move are cool and all, they rely on an existing system. The X-Box 360 and the PS3 have been competing with the Wii. Cost - The Wii is chepaer than a 360+Kinect or a PS3+Move+EyeToy; however you need to consider that MS and SOny are not trying to win over new customers, but mainly trying to keep their existing customers from also supporting their competition by offering a cheaper alternative, so a Kinect/Move by itself is cheaper. You also did not factor in the cost, of many of the Add-Ons required for a Wii. Some games are packaged with them but are at a higher price point (Wii-Fit). Just walk into Toys-R-Us and look at the 2-3 kiosks full of addons by the registers. Those add up big time and probably make the Wii more expensive in the long run. Space - My comment about add-ons for the Wii fits here as well. Nobody I know who has a wii has been able to avoid the constant add-ons required for many games or that come with it. It has become such a problem that Wii Storage Towers can be bought everywhere (even Bed Bath and Beyond) which you won't find for the 360 or PS3. The storage for the addons really makes the smaller Wii a much larger space hog than either the 360 or PS3. Function - You are correct that Nintendo focusing on gameplay over graphics/hardware has resulted in many qualiity Nintendo games, but that quality has not transferreed over to 3rd party developers who frequently make poorly done ports with tacked on motion controls. Its gotten better over time but it is not gone. In addition, developers for the 360 and PS3 have become more innovative and focused on gameplay than when the systems first came out, and this holds true to the Kinect at least which I have first hand experience with. The launch games for the Kinect are all quality games so far with the worst of them being just as good as the Wii Sports/Fit games and the leanring curve much easier. The motion controls for the Kinect are more precise and more intuitive than the Wii's, and it was a lot easier to play the Kinect sports game than my first try at Wii sports/resort. I was surprised by this since I expected the same problems but Microsfot did an excellent job on quality and gameplay (cannot speak for the PS3 move). Marketability - I do agree that only Nintendo does a good job promoting the enjoyment of their system, but I expect that to change with the Kinect as all the games coming out for it are more of the Nintedo-style or unique fun games that will be promoted (and the new Kinect commercials are that way). But like I said before I believe that they are trying to keep their own customers from spending money on their competitors and while I would normally think that any 360 owner who wanted motion controls would have already bought a Wii, over 3 million sales of the Kinect (5 million expected by end of year) prove that is not the case. So they must be doing something right. Again I also think the general take on SOny and Microsoft trying to beat Nintendo is slightly wrong. All 3 systems are here for at least 4 more years before new ones are released and Sony/MS know they cannot top sales of the Wii, so are most likely not trying to win over new customers but keeping their own customers money in house. I do hope that Nintendo keeps its mentality as far as gameplay and options but does choose to compete more with the others on hardware. SOme Wii games are loads of fun and look nice, but you can tell that they are sometimes squeezing all they can out of the system, and long run, and next generation, that will prove to be much harder now that both their competitors have their own proven technology that matches their own. Interesting, and I agree, although I still believe the overall goal is to beat Nintendo. Nintendo jumped from 3rd place with the Gamecube to champion with the Wii, and Sony and Microsoft have shown that they are unwilling to be relegated to the bottom of the list. While this may be an attempt to keep customers buying in-house, and while their devices may be more technical then the Wii, I still see it as too little too late.